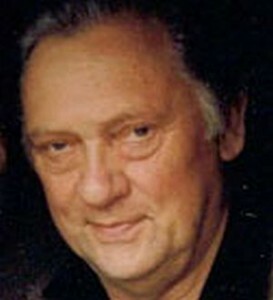 On Wednesday 12 November Richard Pasco became the third eminent Shakespeare actor with close associations to Stratford-upon-Avon to die in 2014. Sadly there has been little immediate media interest, unlike that which met the death of Donald Sinden, and, locally at least, Jeffery Dench. But back in the 1960s, 1970s and early 1980s this modest man was playing leading roles with the RSC: Richard II, Polixenes, Orsino, Jaques and Timon of Athens, and he will be fondly remembered by all who attended these productions or who heard him perform in poetry readings with his wife, Barbara Leigh-Hunt. On TV his most important Shakespeare role was Brutus in the BBC’s Shakespeare production of Julius Caesar screened in the late 1970s (NB this is wrongly attributed in the YouTube clip of the production). There are few recordings of his work, though a number of sound recordings were made at the Aldwych Theatre and are now available at the British Library. An extract of one, his performance of the deposition scene from Richard II, is on The Essential Shakespeare Live CD set. Recorded directly from the stage of the Aldwych Theatre in London it is impressive to hear how much subtle musicality he kept in his voice during live performances in a large theatre. His voice has the warmth of a bassoon played against the bright brilliance of Ian Richardson’s french horn. 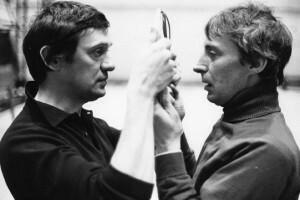 That 1973/4 production of Richard II is the one for which he will be best-remembered, the one in which he and Ian Richardson alternated the roles of Richard and Bolingbroke. The concept, by the play’s director, John Barton, would have been remarkable in its own right, but was raised to the highest level by the acting of both leads who were, as Sally Beauman puts it in her history of the Company, “in brilliant form”. This production has gone down in history as one of the RSC’s finest. “He enriches the Ages of Man speech by making each age a self-contained antithesis, with a twist in the tail. He signals recognition of each predictable folly with a most delicate play of feature, points each deflationary line with a musical accuracy that is a joy in itself”. It was this production that a young Gregory Doran saw and which inspired him to pursue a career as an actor and director. And poignantly, the Rosalind which Pasco so overshadowed was Eileen Atkins, currently performing in The Witch of Edmonton in Gregory Doran’s production at the Swan Theatre. 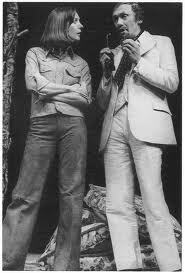 I didn’t see either of those performances, but I did see his Timon at The Other Place in 1980, in which he perfectly modulated his voice so as never to overwhelm the intimate space. The same year he played Clarence in Richard III, a small part that contains one of Shakespeare’s greatest speeches, describing the horror of drowning. I still remember being mesmerised by hearing it as part of a poetry programme. And I remember hearing him deliver the Seven Ages speech at another poetry reading. He had a rare talent for delivering, in that beautiful voice, those big speeches where all the action stops and the audience concentrates on a single speaker. He would have been my dream casting for Prospero in The Tempest. He took part in John Barton’s TV series Playing Shakespeare, and it is wonderful to be able to see him in three of the episodes. I hope you enjoy these performances by a truly great actor who will be much missed. In the Irony and Ambiguity episode, the Deposition scene in Richard II. In the episode Rehearsing the Text he and Judi Dench are Orsino and Viola in Twelfth Night. This entry was posted in Legacy, Plays and Poems, Shakespeare on Stage and tagged As You Like it, Barbara Leigh-Hunt, Gregory Doran, John Barton, Richard II, Richard Pasco, Robert Smallwood, Twelfth Night. Bookmark the permalink. Thank you so much for your words about Richard Pasco. Like you I am very disappointed that until now his death has gone unmarked in the media. However, my friends and I have been remembering his many great performances with delight. I was thrilled to meet him a few years ago to be able to tell him how much I had enjoyed his Richard 11/Bolingbroke performances. Unforgettable. This is so sad, I will never forget his wonderful “..All the world’s a stage…” unique and poignant. I too,am so very disappointed that this wonderful actor and lovely man has died without any mention in the media.